One of the few black professionals of his day, 'Henry' Roy Brown played for Watford from 1953-1957. There was a boom in football just after the Second World War. Many British league clubs began signing players from abroad, particularly the Empire and Commonwealth. During the 1950s and 60s Africa became a favoured destination for scouts. 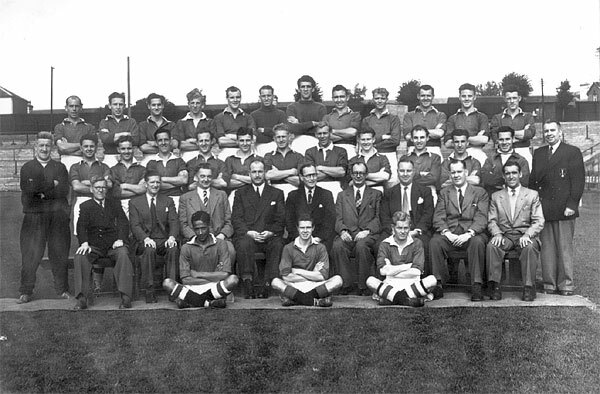 A number of professional Anglo-Indian players emerged at this time, including Ricky Heppolette, Kevin Keelan, Roy Smith and Bud Houghton whose families all moved to Britain after Indian independence in 1947. One of the very few black professionals of his day, ‘Henry’ Roy Brown played for Watford from 1953-1957 as centre-half, winger and centre-forward. He was distinguished for his speed and heading ability and his only hat-trick was the club’s first at home in the League for 8 years. His brother became Lord Mayor of Stoke on Trent. Are you Clive Chattin I knew many years ago and was married to Anne ? The person on the above photograph pictured between Roy Brown and Jim Bowie is not Clive Chattin. This picture must have been taken prior to October 1954.
johnny meadows is my mum’s brother. he is still well and enjoys a round of golf and this year celebrates his 60th wedding anniversary. it was well documented in the papers at the time as he got married and then played football on the same day – couldn’t see that happening nowadays !!! Ralph (Roelof) Oelofse is my uncle. He is my mother’s brother (born Elsie Oelofse). I have always been very proud of his achievements as a sportsman and a fantastic family man. He is sorely missed. missing players names.next to jimmy jones charlie galogoly irish full back . following jimmy kelly is tommy eggleston .Not sure of both surname spellings. Jimmy Jones; ? ; Johnny Meadows? ; Maurice cook; Ernie Bateman; Reg Saphin; Dave Underwood; Phil Nolan; Ralph Oelofse? ; Jimmy (Tug) Wilson; Bill Shipwright; ? ;Pat Molloy; Tony Hapgood? ; ??? Brown; Dave Bewley; Eddie Smith; Jimmy Kelly; ? ; Frank Mitchell; Tommy Paterson? ; Johnny Paton; Les Thomas; ? ; ? ; ? ; ? ; ? ; ? ; ? ; ? ; ? : Len Goulden; Roy Brown; Clive Chattin; Jimmy Bowie.